As a busy food-focused entrepreneur, you will love learning about Food Writing for Bloggers with Kate Kordsmeier. Kate talks about how she started her career as a food writer sharing about tastes and travels from around the globe. Today she has turned her passion for food into a career as a food blogger. Sign up for our Chopped Pinterest and Instagram Courses today! You’ll enjoy a series of videos made by food bloggers showing how they do the work! That’s right, you’ll see their behind-the scenes processes, showing how they use Pinterest and Instagram, how they share their content, what scheduling tools they use, and more. Sign up today for the Pinterest for Food Bloggers Course. Or sign up for our newsletter (see form below) so you’ll be the first to hear about our upcoming SEO Course. If you’re loving the Chopped Podcast and you want to help support the show, we now have a Patreon account. 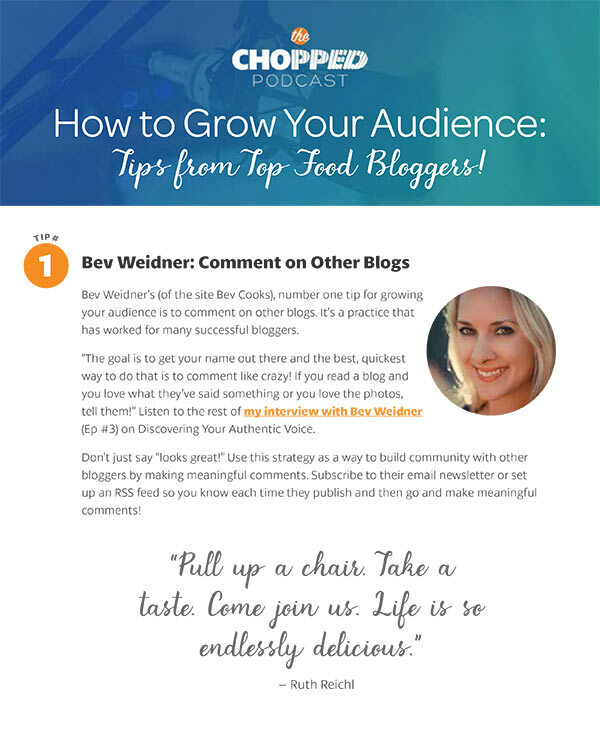 There are two simple ways you can contribute — $3/month or $10/month where you’ll receive an invite to a regular webinar to talk about food blogging. If you’ve got questions, we’ve got answers! Support the Chopped Podcast on Patreon today! Thanks in advance to everyone who helps support the show. It is greatly appreciated. Kate was living the life as a food journalist, traveling the globe and dining at the world’s best restaurants. And then one day Kate received a diagnosis that required a big change to her diet. Her job was a dream job in so many ways but it was not easy on her stomach. She had to change her diet and as a result she didn’t know what she was going to do about her job. Her story is one that is a testament to the power of food to change your life. In true “silver lining” tradition, she felt like the stars aligned and several things in her life changed, making it possible for her to make a big career change as well. When she first considered food blogging as a career, she was hesitant. Her initial impression of food blogging was that it was mostly people blogging for free stuff. That is not what she wanted as a career. But then she started following the income reports on Pinch of Yum and they helped her realize that food blogging could be a career, and a lucrative one at that. Through her process of research (a skill she learned as a journalist), she realized that food blogging was a serious career to consider. Of course, then she started her food blog and soon she realized it was a lot more complicated than she thought it would be. There is a lot of work involved as a food blogger than one realizes from the outside looking in. So she began listening to podcasts and taking courses to hep her figure out how to make it work. She also invested her initial income back into the business. It meant she took a hit early on, but she was playing the long game and her investments eventually paid off. Kate talks about how she hired help in the form of experts and assistants to help expand the reach of her blog. She shared about a dilemma a lot of food bloggers experience: Do you spend money to make money…or do you make money to spend money? For Kate, she decided to spend money to make money. She reinvested all the money from the first 6 months back into her blog so it could grow her business into one that worked for her. She talks about some of her favorite podcasts and resources that she used to grow her site on today’s episode. Then we got into the topic of food writing for bloggers. Sure, our business is about food photography and social media and marketing and partnering with brands too. But what about the food writing aspect of being a food blogger? Kate talks about the ways we can all improve our food writing. Her favorite tip? In order to be a better food writer, read really good food writing. Take a cooking class to become an expert in what you’re doing. Know your craft. Go to cooking school if that’s what you really want. Kate also takes a stab at this engrained mentality that says we should be sitting at a desk from nine to five. If we’re not at a desk between nine and five, it feels like we’re not being productive; not working hard enough. Kate points out, not every job in the country takes the same amount of time. She suggests instead of feeling guilty for meeting a friend for lunch or running errands during the day, celebrate the flexibility you have in your career. As I point out in this discussion, oftentimes we find ourselves shooting recipes on a Saturday which can more than make up for any hours spent on a Tuesday afternoon away from our computers. Besides, I find a lot of inspiration when I’m out and about and that inspiration leads to greater enthusiasm for my work! Kate talks about how she did a social media detox. For her this meant staying away from social media for a certain period of time (say a weekend or even a week). She also required of herself a daily one-hour walk with no podcasts, only listening to music. She found the detox to be inspiring and something she plans to do regularly. 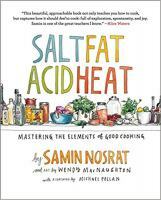 Excerpt from Amazon: “Named one of the Best Books of 2017 by NPR, Buzzfeed, The Atlantic, The Washington Post, Chicago Tribune, Rachel Ray Every Day, San Francisco Chronicle, Vice Munchies, Elle.com, Glamour, Eater, Newsday, Minneapolis Star Tribune, The Seattle Times, Tampa Bay Times, Tasting Table, Modern Farmer, Publishers Weekly, and more. Join the Chopped Newsletter list (scroll down to the form at the bottom of the page). Do all three to increase your chances! Then either send me an email (marly at chopped dot academy) or place a comment below letting me know which ones of these you did. Then at the end of January 2018, we’ll pick a winner and will send an email. How exciting! Leave a review of the Chopped Podcast on iTunes! Simply click on this link and then click on “view in iTunes” where you can leave a review. Join the Chopped Blogger Facebook Group! 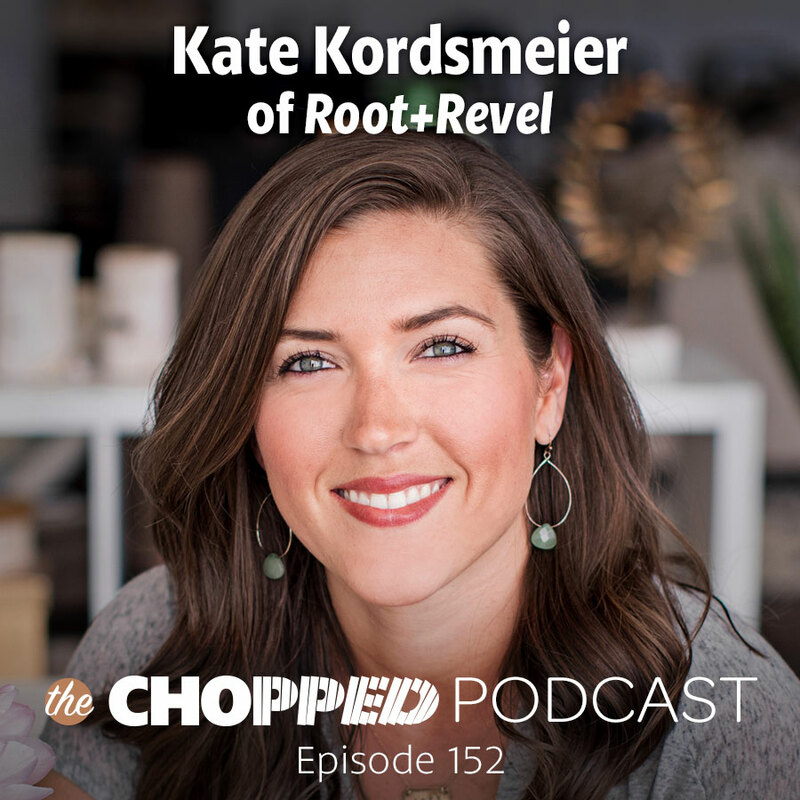 Hi Marly, love your podcast and excited about this episode because it combines my two loves – food and travel. I signed up for the FB group, left an iTunes review, and I’m already a subscriber to the newsletter. Excited to enter this giveaway and to learn more from you and Kate! I enjoyed this podcast episode as always! I listen to them regularly and find them a great source of inspiration and education for my food blog. I appreciate the professionalism with which Kate runs her business. Hi Marly, Just started listening to podcasts and loved the tips Kate shared on becoming a better writer. I am so excited to check out the book recommendations. I joined your FB group to enter this giveaway. Great podcast, I really enjoyed this conversation, so many great points about Instagram too!